The big night is only two days away, so make sure you don't miss out on one of the best local events of the summer! Below you can find directions, band information, and even a slideshow of last year's party! The doors open Friday June 11th at 7:30pm. Anyone 21 and older are welcomed! Daze End will be kicking off the night at 8pm, followed by Vendetta at 10pm. 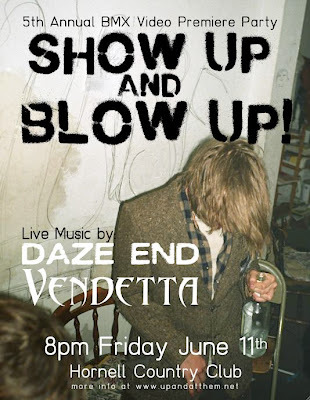 The premiere of "SHOW UP AND BLOW UP" will begin at 11pm, followed again by Vendetta closing out the night! I advise you to come early and stay late because this is going to be one wild night. Slideshow from last year's party! "Why did they have to gay-up my favorite beer?" That's right below is the new look of Genny Light. Rumors are that the Genesee Brewing Co. is aiming for a new "blue collar" demographic as well as expanding the beers sales across the U.S. Their marketing department has even created a character who is intended to draw the "Git-R-Done" types of beer drinkers named Chet Hammerton. 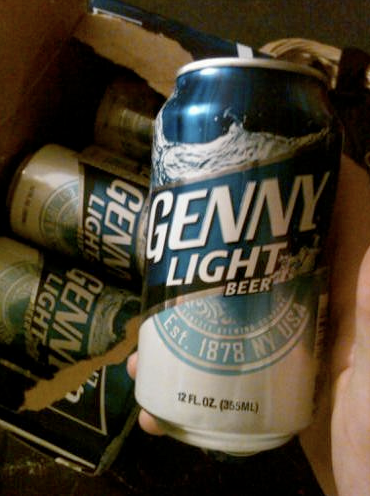 Personally, Genny Light just lost a very loyal patron. Thanks to Dope Shits for the title quote.